A team of “Gronk Nation Boston 2017” runners who finished the Boston Marathon this week on behalf of the Patriots tight end raised $90,410 for the player’s foundation. The group of 10 runners fundraised for the Gronk Youth Foundation, a non-profit started by New England Patriots player Rob Gronkowski and his brothers to help children engage in sports, fitness, education and community. The family’s organization participates in events across the state to raise money, including other races like the Falmouth Road Race this coming August. From May to June, the foundation will host a Rob Gronkowski Football Camp for children in elementary and middle schools. 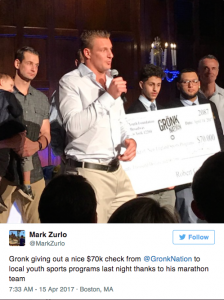 In a statement, “Gronk Nation” said Gronk joined his father and brothers in giving $70,000 to private Catholic school, Cristo Rey Boston High School, last Friday. The family offered the marathoners some Gronk-only perks, like riding on the “Gronk Bus” and having a Gronk Fitness crew cheer them on at the finish line. This article originally appeared on MassLive on April 20, 2017.